What kind of cookware is suitable for my Electric Range (NE58K9500SG)? What your cookware is made of determines how evenly and quickly heat is transferred from the surface element to the pan bottom. Aluminum is an excellent heat conductor. 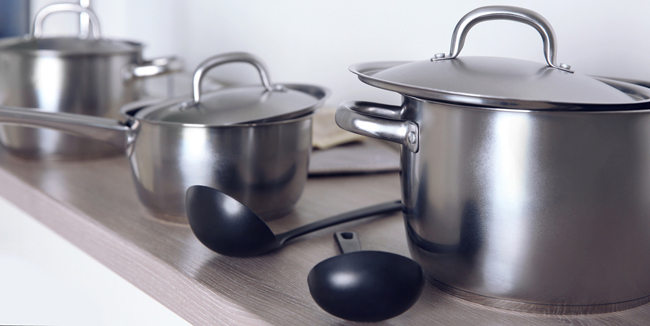 Some types of food will cause the aluminum to darken (anodized aluminum cookware resists staining & pitting). If aluminum pans are slid across the ceramic cooktop, they may leave metal marks that resemble scratches. Remove these marks as soon as the cooktop cools down. Copper is an excellent heat conductor but discolors easily. May leave metal marks on ceramic glass. Stainless steel is a slow heat conductor with uneven cooking results. Stainless steel is durable, easy to clean and resists staining. Cast iron is a poor conductor but it retains heat very well. It cooks evenly once cooking temperature is reached. Cast iron is not recommended for use on ceramic cooktops. Heating characteristics will vary depending on the base material. Porcelain enamel coating must be smooth to avoid scratching ceramic cooktops. Glass is a slow heat conductor. Glassware is not recommended for ceramic cooktop surfaces because it may scratch the cooktop surface.